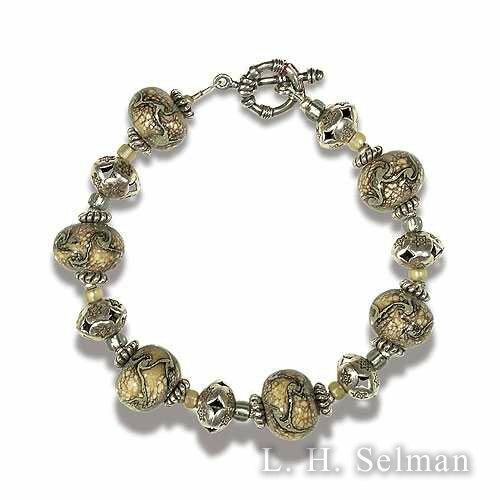 Wasserman bracelet w/iris-gold glass beads, gold beads, etc. 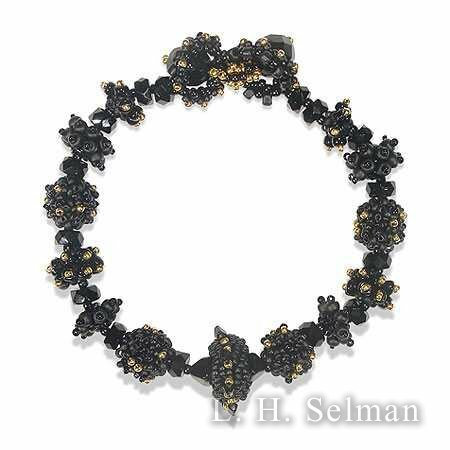 Ann Wasserman iris-gold glass bead bracelet. Six iris-gold glass beads, with spaced raised dots on the surface, alternate with small gold-plate and seed beads. Gold-plate spacers and hook. Length 7 3/4. 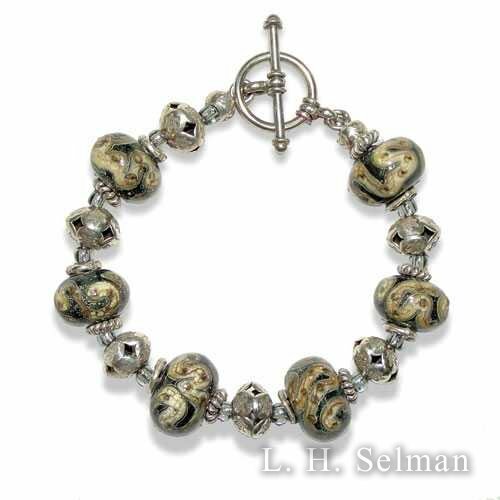 Ann Wasserman Bark Cloth glass bead and silver bracelet. Seven silver and ivory decorated glossy black beads, alternate with embossed sterling silver beads and dark brown seed beads. Sterling silver spacers and hook. Length 8. 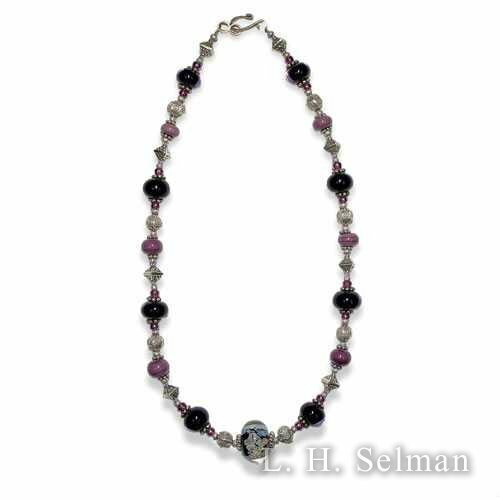 Ann Wasserman "Raku" plum and black bead necklace. 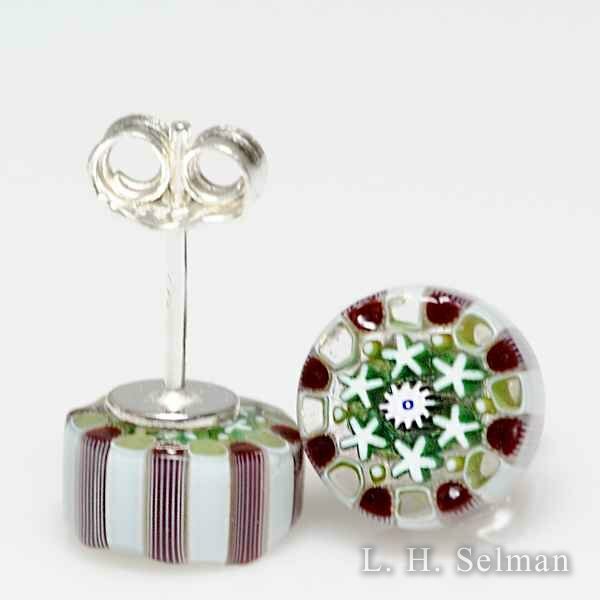 A large clear-encased violet and ivory-speckled black raku bead is bordered by assorted smaller beads, of clear-encased black and plum, which alternate with seed beads and embossed sterling silver beads and spacers. Sterling silver hook. Length 16 3/4". 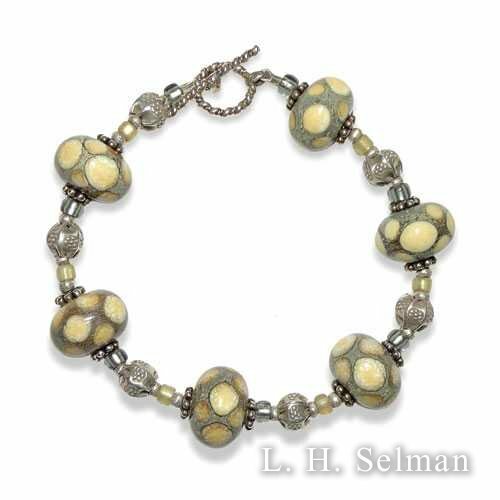 Ann Wasserman ivory and silver-gray glass bead bracelet. Six translucent silver-gray beads, each with an ivory scroll design, alternate with embossed sterling silver beads and clear seed beads. Sterling silver spacers and hook. Length 8". 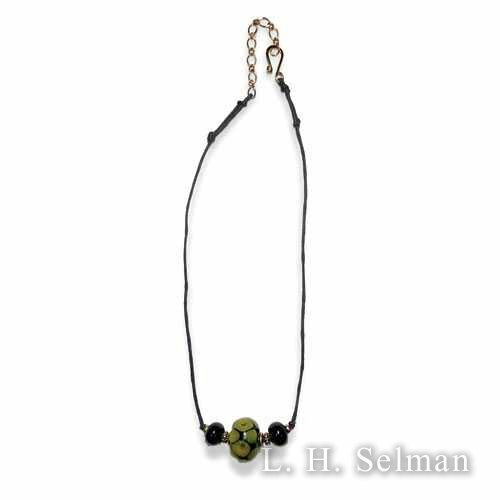 Ann Wasserman ocher and black bead necklace, with a large ocher-spotted black bead, bordered by two black beads and gold spacers. Black cotton cord, with gold-plate hook. Length 17 1/2. Ann Wasserman ivory-spotted silver glass bead bracelet, with six dark ivory-spotted silver-gray beads, alternating with smaller embossed sterling beads and seed beads. Sterling silver spacers and hook. Length 8 1/4. 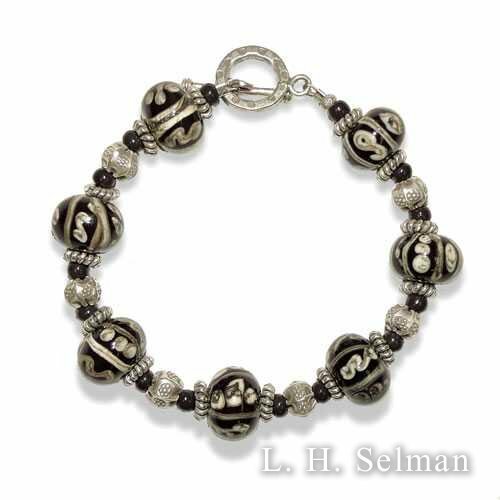 Ann Wasserman twisted silver glass bead bracelet, with six large silver-wrapped dark ivory beads, alternating with embossed sterling beads and seed beads. Sterling silver spacers and hook. Length 8 1/2. 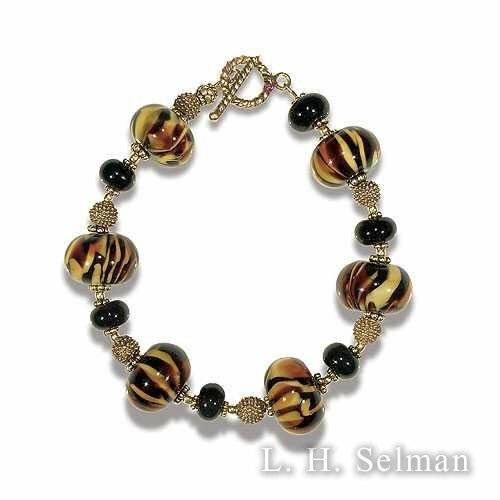 Ann Wasserman Tiger Print glass bead bracelet, with six amber, brown, and black beads, alternating with small black and gold beads. Gold-plate spacers and hook. Length 8 1/4. 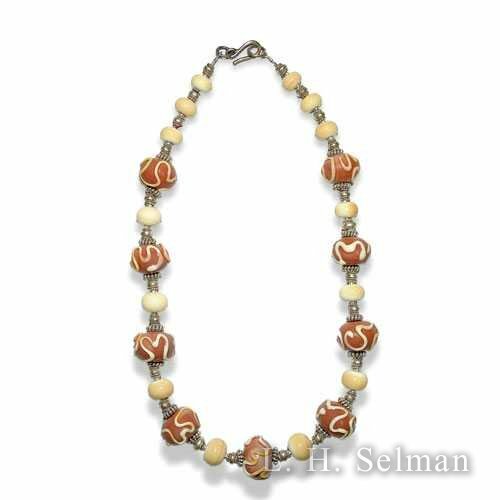 Ann Wasserman pink and caramel-colored glass bead necklace. Nine dusty-pink beads, with off-white and caramel-colored curved ribbons on the surface, alternate with smaller tan beads, silver beads, and silver spacers. Sterling silver hook. Length 17". 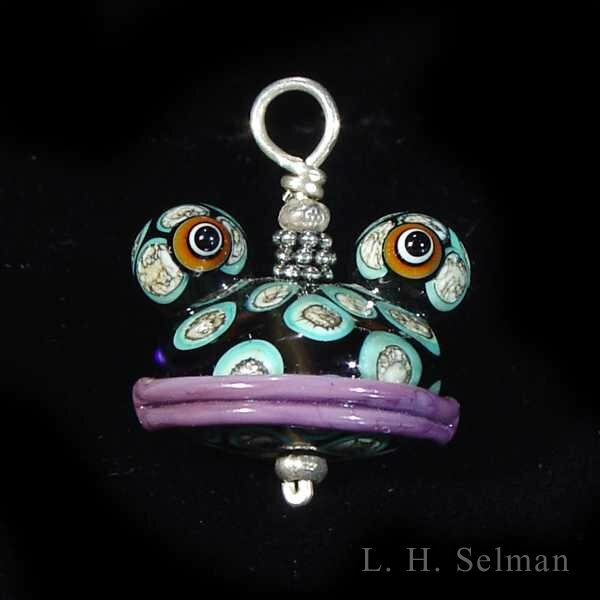 Wayne Robbins one-of-a-kind medium glass frog head pendant. The translucent dark gray frog has mauve lips, and spaced blue-rimmed ivory and gray spots. Length 1 1/8. 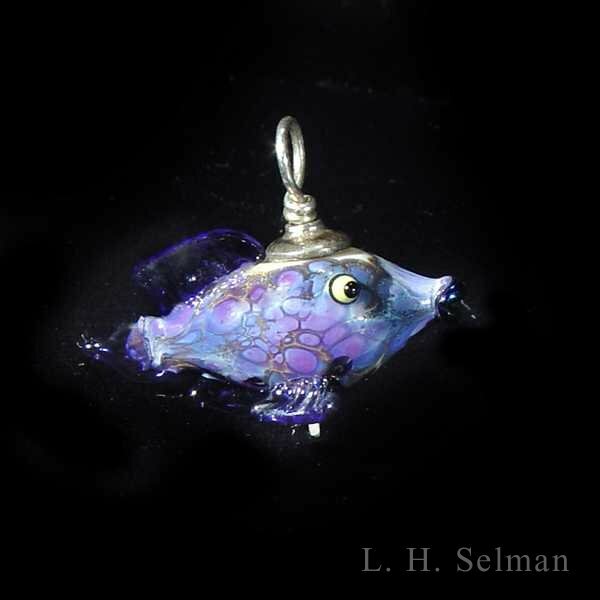 Wayne Robbins one-of-a-kind small glass frog or fish pendant. Length 3/4. 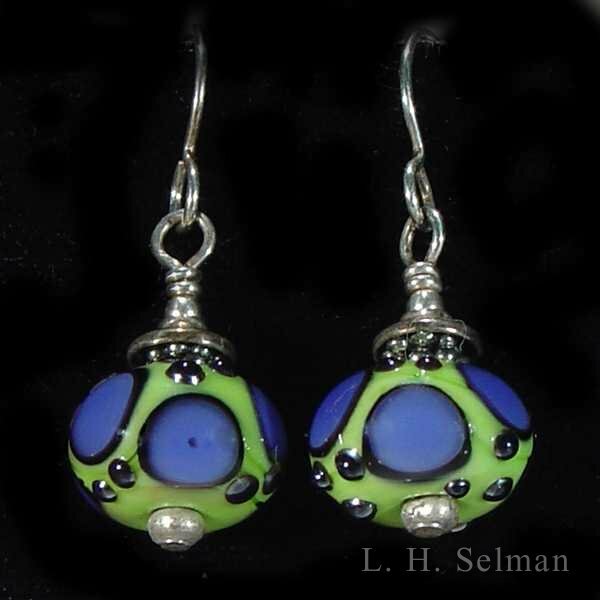 Wayne Robbins one-of-a-kind glass bead earrings, with sterling silver wires. Length 3/4 - 1. 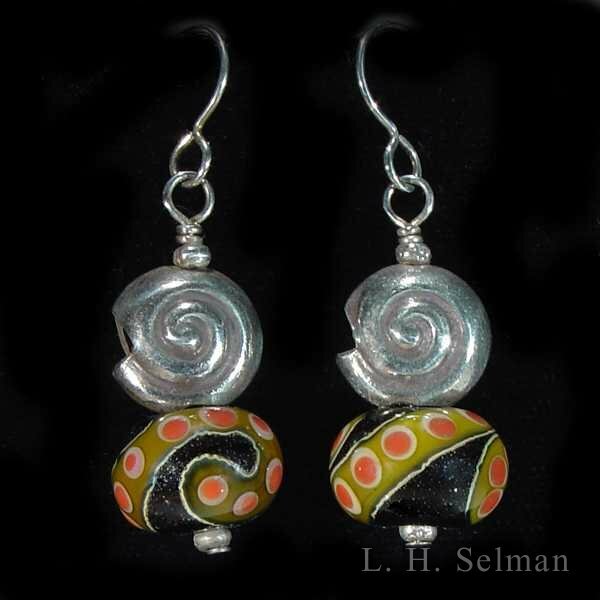 Wayne Robbins Shell glass bead earrings, with sterling silver shells and wires. Length 1. 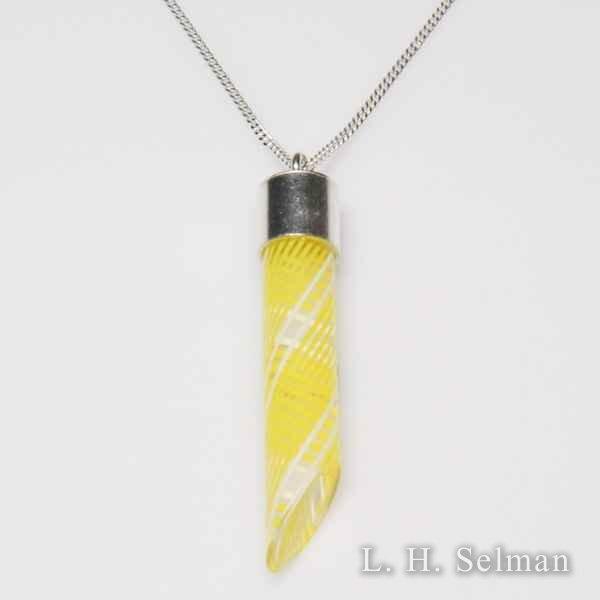 Mike Hunter (2017) yellow and white latticinio glass pendant silver necklace. A cylindrical cane of yellow latticinio, with a white-rimmed clear stripe spiraling down, is bevelled at the end and mounted into a silver tube attached to a silver chain. 925 silver. Pendant length 1 5/8". 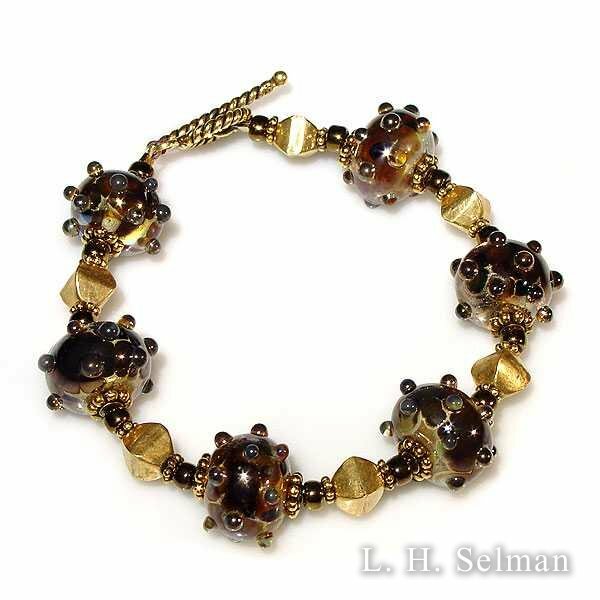 Roxie LaSoya black and gold beaded beads and glass bead bracelet. Thirteen beaded beads, alternate with faceted black beads. Loop and bead cufflink closure. Length 7. Damon MacNaught (2018) anchor earrings. Damon MacNaught (2018) anchor earrings. 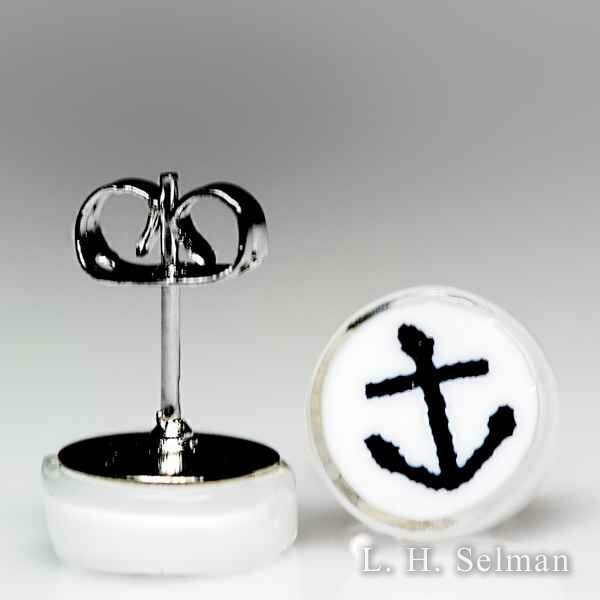 Black silhouettes of anchors stand against white backgrounds to create thematic studs. They are mounted on metal butterfly fasteners. Diameter 3/8". Damon MacNaught (2018) red, green and white millefiori earrings. 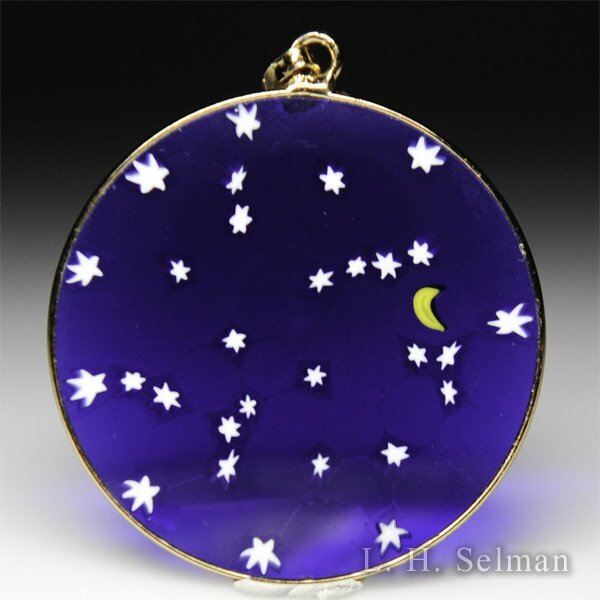 Antica Murrina Veneziana, Murrano glass millefiori moon and stars large pendant. Antica Murrina Veneziana, Murrano glass moon and stars large pendant. A scattering of white stars surrounds a yellow cresent moon on a translucent colbalt blue background, set in gold. Original Murrano glass, sterling silver 925/1000, gold plated 24 karats. Pendant diameter 1 1/4”. Antica Murrina Veneziana, Murrano glass millefiori green and red flower tree pendant. Antica Murrina Veneziana, Murrano glass green and red flower tree pendant. 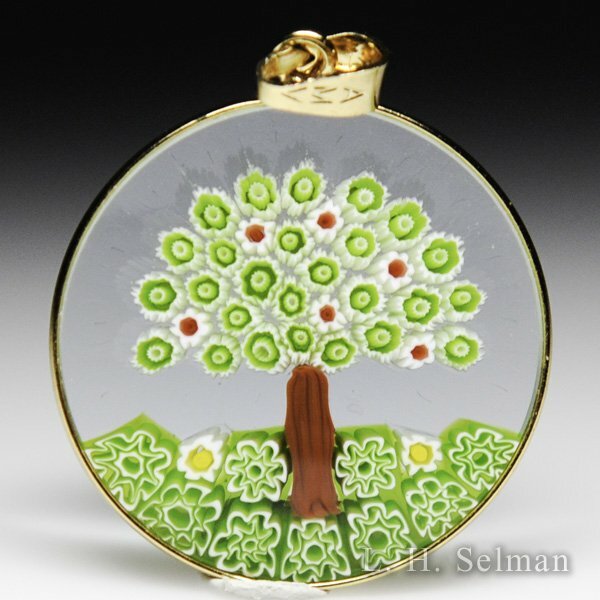 A green millefiori tree, with red flowers, sits at the center of the pendant on a clear background, set in gold. Original Murrano glass, sterling silver 925/1000, gold plated 24 karats. Pendant diameter 1”. Antica Murrina Veneziana, Murrano glass lavendar tree Star of David pendant. Antica Murrina Veneziana, Murrano glass millefiori lavendar tree Star of David pendant. 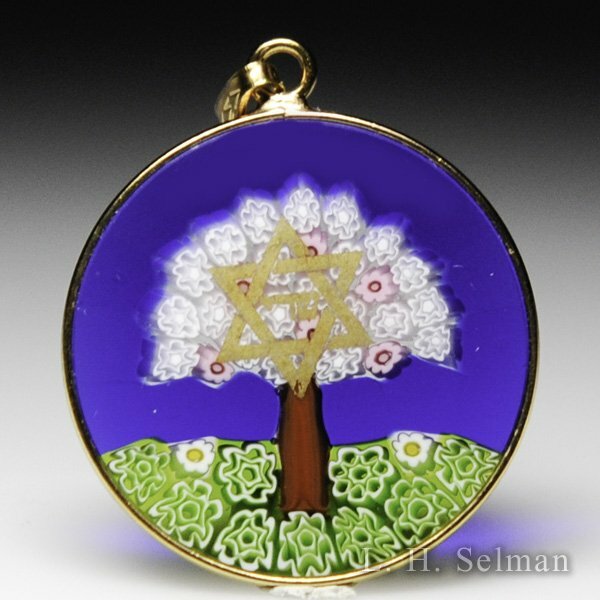 A lavender millefiori tree, with a gold Star of David overlay, sits at the center of the pendant on a translucent cobalt blue background, set in gold. Original Murrano glass, sterling silver 925/1000, gold plated 24 karats. Pendant diameter 1”. Antica Murrina Veneziana, Murrano glass millefiori red tree pendant. Antica Murrina Veneziana, Murrano glass red tree pendant. 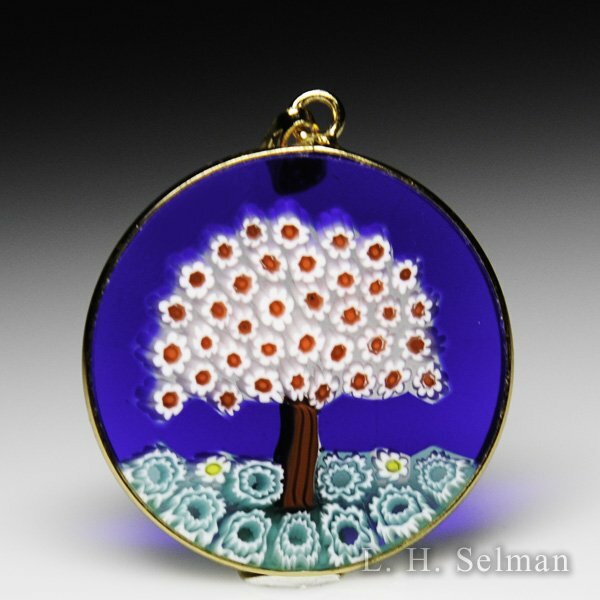 A millefiori tree, with pink flowers that have red centers, sits at the center of the pendant on a translucent cobalt blue background, set in gold. Original Murrano glass, sterling silver 925/1000, gold plated 24 karats. Pendant diameter 1 1/4”. Antica Murrina Veneziana, Murrano glass millefiori lavendar and pink tree pendant. Antica Murrina Veneziana, Murrano glass lavendar and pink tree pendant. 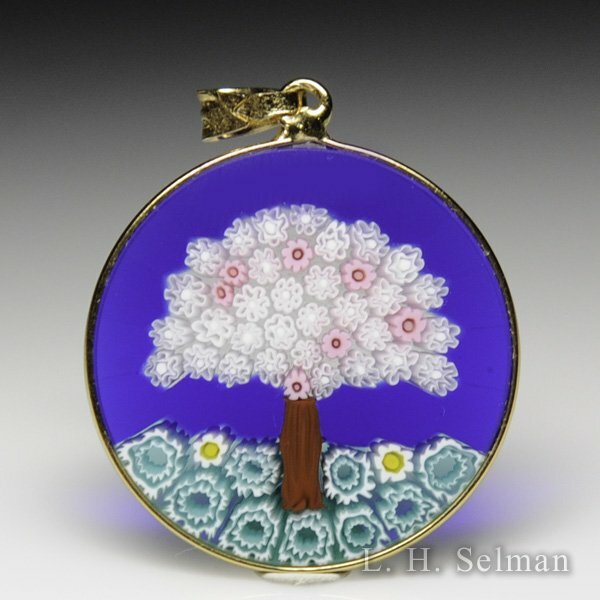 A lavendar millefiori tree, with pink flowers, sits at the center of the pendant on a translucent cobalt blue background, set in gold. Original Murrano glass, sterling silver 925/1000, gold plated 24 karats. Pendant diameter 1”. Antica Murrina Veneziana, Murrano glass green and red flower tree pendant. 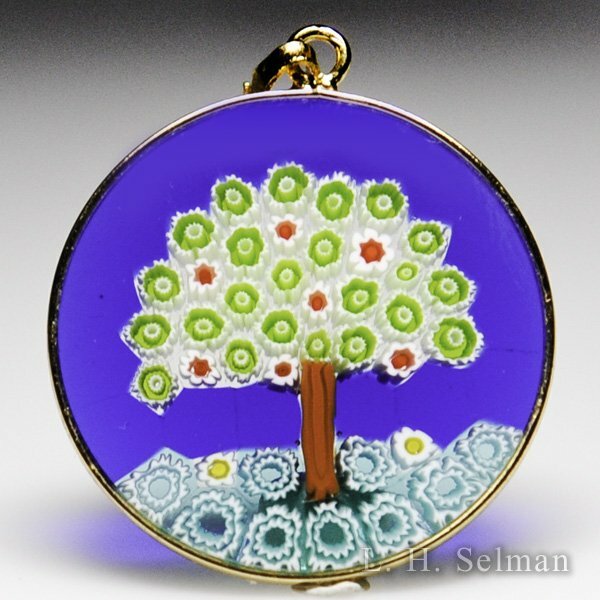 A green millefiori tree, with red flowers, sits at the center of the pendant on a translucent cobalt blue background, set in gold. Original Murrano glass, sterling silver 925/1000, gold plated 24 karats. Pendant diameter 1”. Antica Murrina Veneziana, Murrano glass millefiori multi-colored tree pendant. Antica Murrina Veneziana, Murrano glass multi-colored tree pendant. 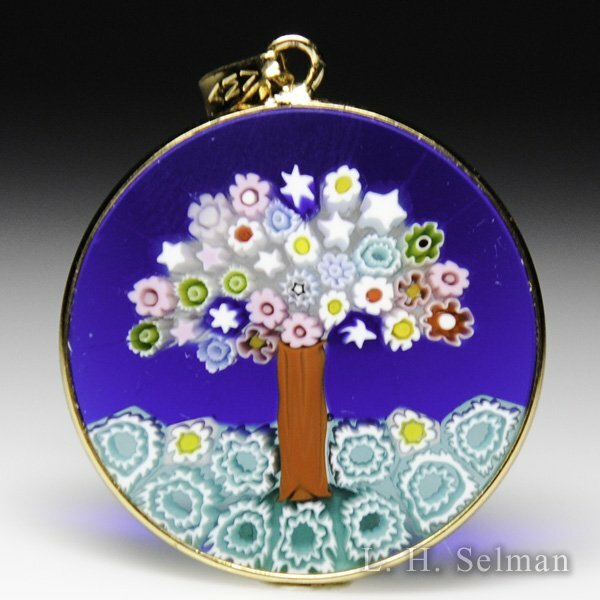 A multi-colored millefiori tree sits at the center of the pendant on a translucent cobalt blue background, set in gold. Original Murrano glass, sterling silver 925/1000, gold plated 24 karats. Pendant diameter 1”.